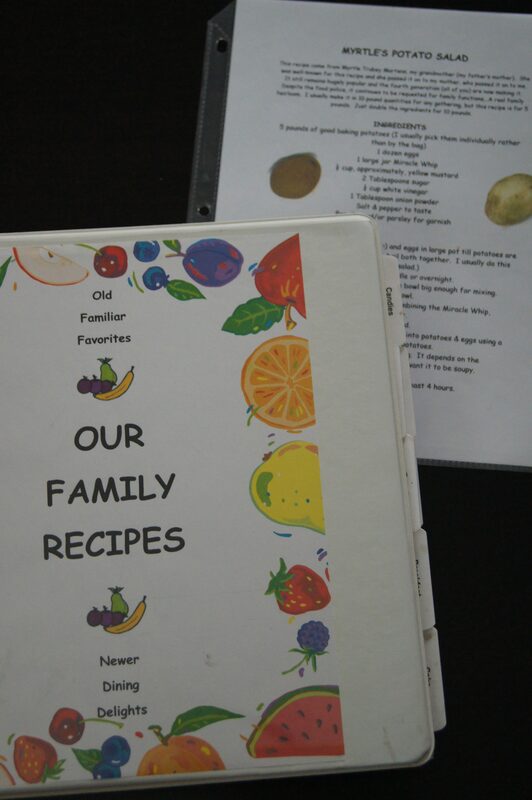 For Christmas 2005, my mother-in-law put a big book of family recipes together and distributed it to all her children. It was a true labor of love, beautifully put together and so organized and researched. She included so many recipes that I recognized from family get-togethers throughout the years. Looking through some of them I remembered how good everything was, and to this day, when I look through the book I remember when I had the particular recipes and what the occasions were. One of the recipes my mother-in-law included was the family’s recipe for potato salad. This is no ordinary potato salad – in both taste and history. This recipe goes way back. It was my mother-in-law’s grandmother’s recipe and I’m assuming that when she made it for the first time women couldn’t even vote. My mother-in-law’s grandmother’s name was Myrtle so you know this recipe goes back a ways. Myrtle really isn’t a modern-day name. But maybe it’ll make a comeback after everyone tries this amazing recipe. 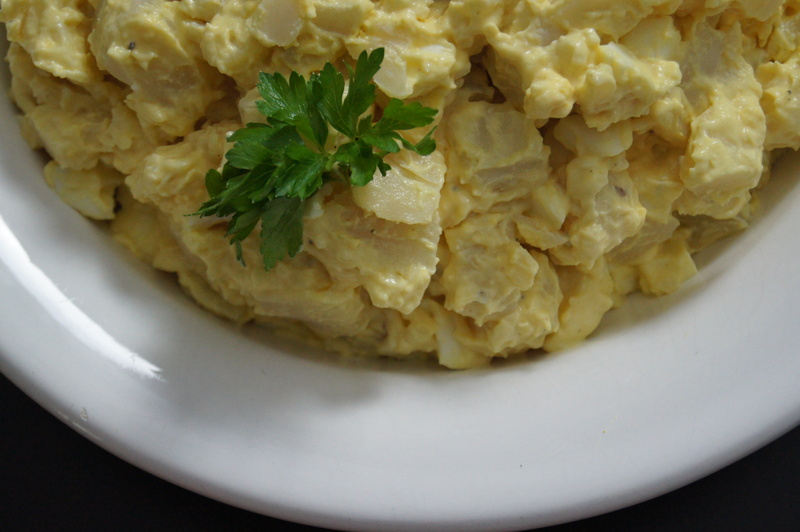 For all we know, someone in the Royal Family could try the potato salad and be inspired to name a future Royal after Myrtle’s delicious dish. Princess Myrtle has a nice ring to it. And I basically haven’t. 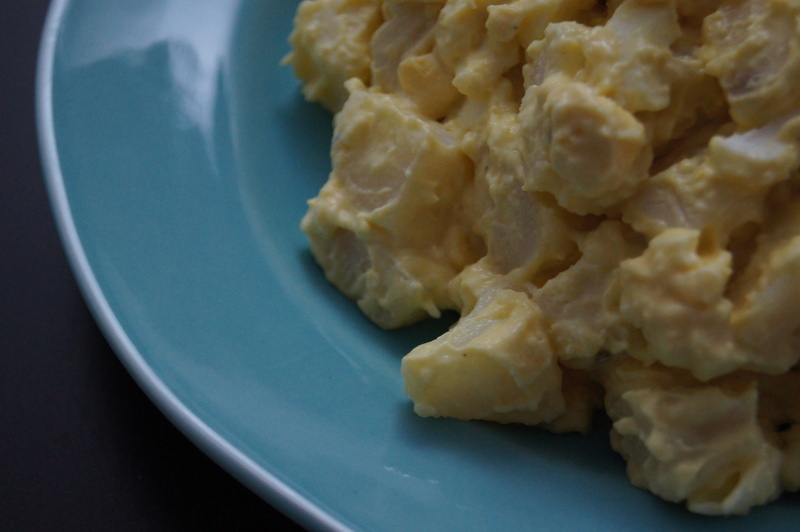 It’s so good, and it’s hard to go back to store-bought potato salad. In the family recipe book, the recipe is referred to as “Myrtle’s Potato Salad.” But I’ve always referred to it as “Mom’s Potato Salad” or “THE Potato Salad.” The recipe calls for the potatoes to be boiled with the skins on. I’ll be honest, it is kind of pain to peel the potatoes after they’re cooked, but I’ve never tried it any other way. If you make this and peel the potatoes before boiling, let me know, because I’m not going to be the one to jinx this recipe! Not gonna lie, it’s not the healthiest recipe. But you know what? So what. It’s not like you’re going to be eating this for breakfast, lunch, and dinner. Well, you could if you really wanted to. I admit, I’ve done that. Maybe I was pregnant at the time. Yes, let’s go with that. But if you eat pretty healthy for the most part you’ll be totally fine. It’s totally worth the indulgence. 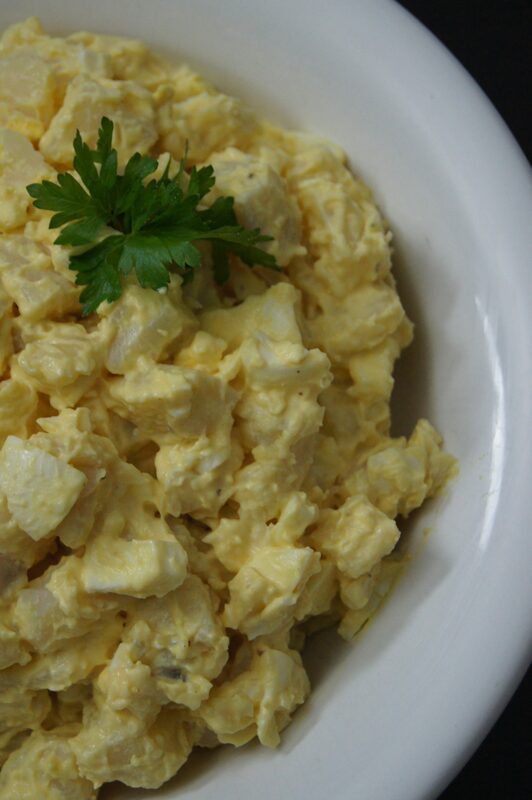 The first time I had the potato salad, my husband and I were still both in college and dating and there was a cookout in the backyard of the house where he grew up. It was a beautiful Victorian house (and still is), built by his ancestors, who immigrated to Jamaica Plain, a suburb of Boston, from Germany. Five years after we were married we lived in the house and had many happy years there and I love that we were the last members of the family to make the house our home before it was sold outside of the family. I continue to make the recipes in the family cookbook, especially at Thanksgiving. I know my sons will use the book when they’re adults, which I really don’t want to think about right now because they’re about to start middle school and high school and I’m in denial that my babies are growing up. Put the potatoes in a large pot and fill with cold water, covering the potatoes to about 1-1/2 inches. Bring to a boil and continue boiling until potatoes are tender, about 15-20 minutes. Place the eggs in a separate pot and cover with cold water, covering by 1-1/2 inches. Do not cover the pot with a lid. Bring to a boil and immediately remove from heat. Cover and let stand for 10 minutes. Put the eggs into a bowl of ice water to cool. Once the potatoes are cooled, peel and cut into about ½ inch cubes or smaller and place them in a large bowl. Once the eggs are cooled, peel and cut them and place them in the same large bowl. In a separate bowl, mix the remaining ingredients to make the dressing: Miracle Whip, yellow mustard, sugar, vinegar, onion powder, and salt and pepper. With a wooden spoon, add dressing to potatoes and eggs, a spoonful at a time. Gently mix with the wooden spoon. Add more dressing as needed. You might not use all the dressing. It depends on the starchiness of the potatoes. You don’t want it to be soupy. Refrigerate at least 4 hours to let flavors blend. Overnight is best. The potato salad tastes best the next day and even better the day after. That is if there’s any left. « More Features Coming Soon!